I was a part of history last night! A pleasure to sing with Dave Davies and have Ray back on stage together after twenty years ! Christmas came early for Kinks fans as, for the first time in nearly 20 years, the Kinks‘ Ray and Dave Davies performed together onstage. The unannounced and unexpected reunion took place Friday at Dave Davies’ concert at London’s Islington Assembly Hall, where the brothers played a rousing rendition of the Kinks’ classic “You Really Got Me” together. I know I probably use this phrase far too often, but this really is something that’s a little bit different and it’s difficult to know where to start. Debi Doss is from St Louis and came to the UK in the 70s as a live music photographer (and a very good one at that) but somehow ended up working as a backing vocalist for her childhood heroes, The Kinks, which led to around ten years of working as a live and session singer for a list of bands that’s way too long for this piece. She even did the female vocal on “Video Killed the Radio Star” and appeared in the video (the first ever shown on MTV USA). All of which helps to explain most of the track listing on the EP. “Video… ” is a mainly acoustic guitar-backed version of the Buggles hit with multi-tracked vocals on the chorus and some subtle electric guitar and handclaps in the bridge; this version proves that it was a great song without the big Buggles production. We all know that “Waterloo Sunset” is a great song, so it’s interesting to hear a version where the intro is acoustic and finger-picked, with the falling chromatic bassline picked out on a six-string at a much slower tempo than the classic Kinks version. The electric comes in on the bridge again for emphasis before dropping back into the acoustic backing and the vocal’s powerful but controlled. And I’ve just realised that Dzal Martin, who I loved in No Dice way back when is the guitar player. “Nothing Lasts Forever”, from The Kinks musical “Preservation” is styled very much like the Kinks original but without the Ray Davies vocal and it works pretty well. “Je Chante” (“I Sing”) is a Debi Doss original written in French and delivered with some nice Gallic cello underneath the vocal; it’s lightweight but pretty and takes to the last track on the EP. “Fly High – Part 1” is a fragment and, I suspect, the catalyst for the release of this EP. It’s a tribute to her nephew, Scotty, who drowned in Big River, St Louis, in June 2014. It’s a mantra with keyboards, xylophone and guitar leading into a coda which feels like a stairway to the heavens and is completed with a xylophone “Twinkle, Twinkle, Little Star” motif. Short, but poignant. 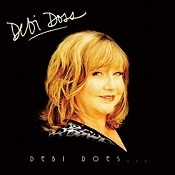 This EP is well worth a listen, but there’s an awful lot more to Debi Doss than the music. If you were into music in the 70s, then you really need to check out the images on her website.